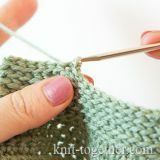 Knit Together | Textured Crochet Stitch Pattern 1, free description, crochet chart and video tutorial. 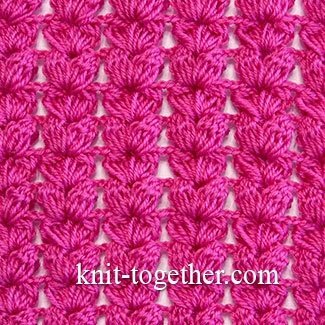 Bobble stitches of 4 double crochet stitches give expressiveness and relief to this pattern. The pattern resembles a puffy rib on a lace background. 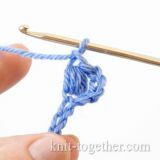 For crocheting, it is better to take elastic lightweight yarn. You should be prepared for a large expenditure of yarn. Using this pattern you can make scarves (the pattern is two-sided), hats, jumpers, jackets. The repeat (rapport) of the pattern - 6 loops by width and 1 row by height. For a sample of pattern make chain stitches a multiple of 6, plus 5 chains for the symmetry of the pattern, plus 4 turning chains. 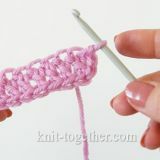 We present to your attention the crochet chart, description and video how to make this pattern using bobble stitches. 1 row: * 1 bobble stitch of 4 double crochet in 6th chain from the hook, 2 chains, 1 bobble stitch of 4 double crochet in next chain, * 2 chains, skip 4 chains, 1 bobble stitch of 4 double crochet, 2 chains, 1 bobble stitch of 4 double crochet, skip 1 chain, 1 treble crochet in last chain of row. 2 row: 4 turning chains, * 1 bobble stitch of 4 double crochet in space between bobble stitches of previous row, 2 chains, 1 bobble stitch of 4 double crochet in same space, 2 chains *, 1 bobble stitch of 4 double crochet in space between bobble stitches of previous row, 2 chains, 1 bobble stitch of 4 double crochet in same space, 1 treble crochet in turning chain of previous row. All next rows are made as the 2nd row. 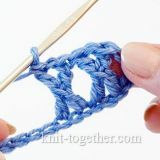 Bobble stitch. 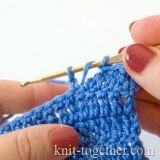 Four double crochet with a common top and a common base (4dc bobble). Bobble stitch. 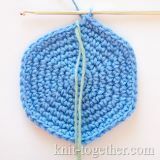 Four double crochet with a common top and a common base (4dc bobble). Make in loop. 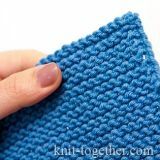 We offer to your attention a video tutorial: how to crochet this textured stitch pattern. Don't forget to subscribe to our channel on YouTube!